One would think that within a Canadian national park, with its emphasis on wilderness preservation and protection of wildlife and natural beauty, that you couldn’t find a golf course. But if we’re talking about Banff National Park in the Canadian Rockies, that’s not the case. Yes, in the midst of panoramic views of scenic alpine peaks and rugged, unspoiled wilderness of the national park, you can hit the links just outside of Banff town at the Banff Springs Golf Course. And this is no ordinary course; it is famous for more than just being set amidst natural splendor. The Banff Springs Golf Course is historic in its own right and serves up some world class golf – and while there are other excellent golf courses in Western Canada, you would be hard pressed to find one with better scenery. The course is located along the scenic Bow River at the foot of Mount Rundle. Stanley Thompson, Canada’s own master golf course architect, designed the original 18-hole course here in 1928. Nine more holes were added in 1989, making for 27 holes of championship layout – more than 6,300 meters. 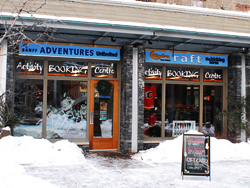 So, when you are ready for some rest and relaxation that is a little more genteel than rock climbing, mountain biking, or hiking, you can always come back to Banff town and hit the links. But get cleaned up first, there is a dress code. Click here fore (heh, get it?) 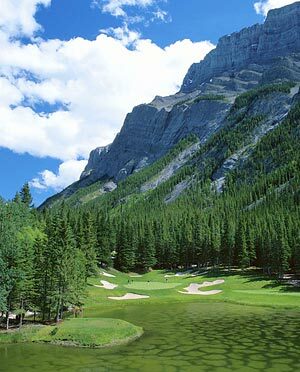 more information on golfing in the Canadian Rockies and Western Canada. Or click here for a quote on a golf package in Alberta or British Columbia. When you’re ready to hit the links you can always organize your golf outing to the Fairmont Banff Springs through Banff Travel.